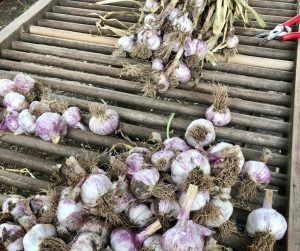 Clipping Garlic has Begun | Patrice Newell's online organic biodynamic Australian garlic and olive oil. Not until we take the garlic curing in the shed and spread the plants out on the garlic tables do we really know how the crop has turned out. Handling each bulb, trimming the roots and stems ( feeding the left overs to the sheep ) gives all of us a true sense of the volume and quality. It feels like a miracle every time. From one small clove a whole new bulb. The earth has provided once again and we feel lucky.